I've recently started a new job and I'm back in an office environment. While I love suiting I try to keep to a smart casual look daily and like to sneak in my personality and flair with each outfit. Recently I've noticed that my go to items are all a mixture of Heart of Haute and ASOS with accessories from Erstwilder. Given that HOH are my go to for smart, pinup styling I wanted to put together a dream list of goodies to get my through a working week. I already own some of these items (but in different colours or prints) and wear them to work already so it's a mixture of lust list and trusted items! Button ups to suit big or small busts, adorable prints and great for layering or wearing on their own. I wear my Estelle and Ella weekly under my black and red Sweet Sweaters and would love a few more button up tops and bows to work with. I've get to try the Gretta top but I love the classic fit, high neckline and the selection of prints. Every business wardrobe needs 3 types of skirts and one pair of tailored pants. Heart of Haute have all 3 covered with these amazing items. A solid black Aline skirt to pair with absolutely everything in your wardrobe. A high waisted pencil skirt to wear with sweaters, fitted shirts and more - why not try a bold red color and more subtle tops in black and white. Then finally another flattering shape skirt in a bold print. I've gone for the Twirl Skirt as I love wearing aline/twirl shapes to the office. The gold dot print is absolutely stunning and I need this in my collection. For the warmer months I've got my eye on 3 stunning dresses! I'm a huge fan of the Monte Carlo Dress from Heart of Haute and need to purchase it's summer sister the Milan. The rich Charcoal Teal is perfect for my red hair and pale skin. Then the Hillary which I own in polkadot already but in the Midnight Stripe. The high neckline of these dresses work wonderfully for the office and they all pair perfectly with my collection of Heart of Haute boleros, cardigans and sweaters. Then finally a bronze and black number to make your heart skip a beat. The Aimee Dress in the Medallions print is simply divine and needs to be a core part of my summer and autumn wardrobe. Each of these dresses complement an hourglass figure perfectly as they nip you in at the waist and flair out at the hip. Then for the colder seasons I've gone with some warmer, thicker fabric choices to keep me toasty as Melbourne cools down. The Super Spy dress was featured in my last HOH blog review and is already a weekly staple so obviously I need the red versions asap. I love to pair my Spy dress with a thick waist belt to define my curves and a bold brooch from my collection. 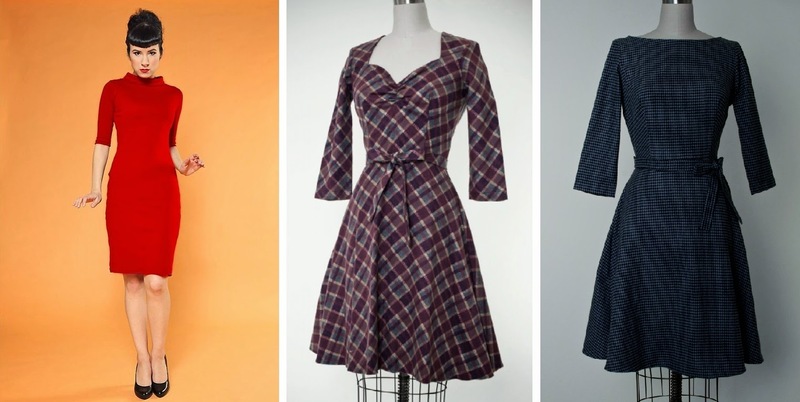 Flannel dresses for winter - yes please! The Alisa and Mitzi dresses are a must have for the cooler weather and are super chic. I'm loving the plaid and stripe prints and the brilliant necklines! The Alisa shows a little more skin white the Mitzi has a super high neckline. All 3 styles will be amazing paired with stockings, boots, leather gloves and beret's. A few more brilliant items to layer over tops and dresses or just wear on their own. The Sweet Sweater is my latest addiction and has taken no.1 spot in my wardrobe followed closely by the Betty Bolero. I adore the fit, the coverage and need one in every colour and print. The I wanted to go with something a little more man men for the office and the Lily Top stood out above all other cotton tops. With a 3/4 sleeve, stunning neckline and bow feature and teal colour this top will pair with all skirts and tailored pants. Then lastly the Perfect Cardigan in Argyle which I already own and adore. I have both the Argyle and the black and they are perfect for work or play. I hope more prints come out in this style. I wear an XL but they are super roomy so I can slip into a Large as well. I have one of each. I reviewed this a while back so if you use my search bar for a specific name of an item you'll find if (if I've worn it) hope that helps hun!